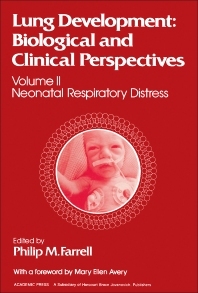 Lung Development: Biological and Clinical Perspectives, Volume II: Neonatal Respiratory Distress is a collection of papers that addresses the needs of small infants who have respiratory diseases. This volume deals with fetal lung development with emphasis on hyaline membrane disease. This book also presents basic information on pulmonary surfactant in the clinical area, particularly in 1) diagnosis and movement of neonatal respiratory distress; 2) prenatal assessment of fetal lung maturity; and 3) prevention of hyaline membrane disease with corticosteroid therapy. One paper reviews the essential clinical aspects of hyaline membrane disease, while another paper discusses data of the physiology of surfactant from a patient with hyaline membrane disease. Another paper examines the radiology of hyaline membrane disease, transient tachypnea of the newborn, and bronchopulmonary dysplasia; this paper also describes the radiographic techniques to be applied on infants. Other papers cite a treatment using antepartum glucocorticoid, as well as other clinical trials involving antenatal corticosteroid. One paper proposes a design and organization of a multicenter clinical trial that will study the effects of corticosteroid in the development of the human lung. This book can prove useful for pediatricians, specialists in respiratory diseases, and researchers whose work involves cardiovascular medicine and radiology.